It is said that if something seems too good to be true then in all likelihood it probably is. There are many examples of this - San Tropez in-shower tan, a very famous and handsome American actor contacting you via a dating website, - I could go on. 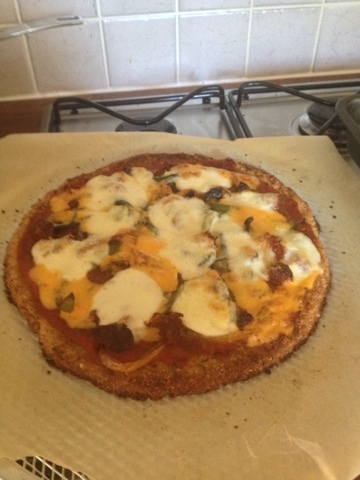 Based solely on my results to date, I should add cauliflower crust pizza to that list. But I'm not ready to just yet. If you have an interest in food, you will no doubt be aware that the internet is currently abuzz with all things cauliflower which has been hailed as the new super healthy, low carb substitute for a whole host of dishes. 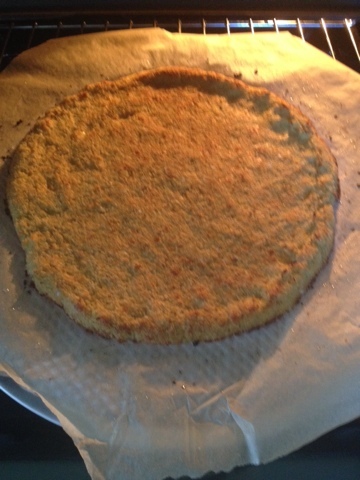 People are using it as replacement 'rice' (which I tried with good success), chopped up and roasted with parmesan into a (questionable) bite sized popcorn alternative (which I haven't tried) and, most thrillingly of all, as the main ingredient in a healthy, flourless pizza base. I had been so excited to try this having seen some of the amazing results and reviews posted online. Pizza was my favourite food I (over) ate in my fat days so I wanted so badly to believe it was possible to eat it freely without an accompanying side of the dough-induced lethargy I am now glad to be without. After much research I chose this recipe which had received loads of amazing feedback. To be fair it started (and ended) pretty badly as I think my cauliflower was gone off . As soon as I milled it up in the food processor it stank the apartment out to the point where I was embarrassed at the thought of passers by smelling it through the open window (and I live on the first floor). However, because I'm not a very regular cauliflower eater I foolishly overlooked this. It's only since I made some (nice) cauliflower 'rice' at the weekend with a non stinky one that I really realised it was probably off (ew). These cauliflower crust recipes involve steaming or microwaving your ground up cauliflower for a few minutes and then (when cooled) squeezing it through a tea- towel until absolutely no moisture remains. This is, in effect, your 'flour' to which is added mozzarella cheese (I had none so subbed cheddar), parmesan (had none of that either so added more cheddar......), an egg and a few other bits. On reflection, having reread that last line, perhaps there were more factors affecting the outcome of this recipe than the dodgy cauliflower alone. The above photo was taken after the base had cooked for 10 minutes in the oven (you have to do this before you add the toppings). At this point, it looked great and my flatmate and I were very excited at the thought of enjoying this amazing healthy pizza but it didn't quite work out like that. I'm sorry I don't have photos but, you'll have to take my word for it that, despite my best efforts to squeeze all the water out of the cooked cauliflower, it definitely didn't hold up as a slice in your hand(as promised). In fact, it was pretty soggy. And it definitely didn't taste very nice either, a bit 'earthy' for want of a better word. Still, we got to eat some melted cheese so all was not lost. 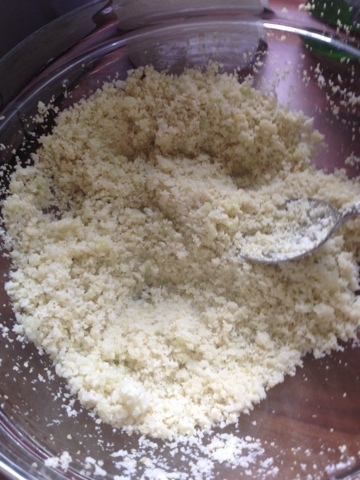 However, I definitely believe that if I make it again with a fresh, non-stinky cauliflower, somehow manage to squeeze even more water out of it, and use the correct cheeses instead of lobbing in whatever I have to hand, it will be a thing of beauty. I believe it because I've imagined it now and it has to be.